Doug Day, a member of our Society, passed away in August 2002. These are his recollections of a childhood on Kaipatiki Creek. My first recollections of Birkdale start from the time when my uncle Douglas Mills bought a farmlet of 6½ acres at the end of Tiri Tiri Road from the younger brother of Arthur Beer a long time resident of the area who owned the property along the right side of the road. Douglas Mills later sold the property on to his father William Mills and his wife Mary. From this time onwards my Father, Mother and myself visited my Grand Parents from time to time and sometimes at holiday times stayed over. For my 10th birthday dad bought me a bicycle that was delivered to the farm and left there for my use at weekends and holidays when we visited. Being too short in the legs to reach the pedals sitting on the saddle dad removed the seat and padded it accordingly so I could sit on the bar. He first taught me to ride along Tiri Tiri Road which is straight and level for some length at its beginning. As my riding ability improved I ventured out of the road and down Birkdale Road that was deserted most of the time in those days. On one of these occasions I had just reached the bottom of Taylor's Hill and got off to rest at Aplins corner when looking along Eskdale Road I saw a girl and boy about my own age coming towards me on bicycles. When they reached me they stopped and we greeted one another and stood for a time talking. They were Edna and Lloyd Mumme and this was the start of a lifetime friendship between Lloyd and myself. When my father died in 1937 my grandparents invited Mum and I to go and live with them, which we did. I was then 12 years old so transferred to Birkdale School for the last part of the term. Now that I lived permanently in the area friendship between Lloyd and myself grew rapidly and I got to know and befriend others. One of these was Ted Hopkins whose father owned the property on which the Ranch House stood. It was orchards in those days. Lloyd's parents owned the property on the point where the waters part to go up Kaipatiki Creek and to the culvert under Beach Haven Road. Both spots were ideal for swimming at full tide so we had our fair share of dips in the summer days. 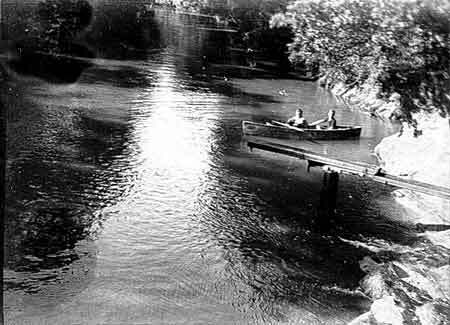 It was an ideal spot for small boats as well so it was not too long after that Lloyd bought a canoe for use in the creek. This had a wooden frame and was covered with canvas. It was very broad for its length of about 2 metres having been built as a sailing canoe. Lloyd found that two short paddles were more suitable than the long double one supplied with it. As time went on realising the fun to be had I decided to try and build a similar craft myself. I had no idea how to go about the job but decided to bumble along with the help and advice of my grandfather. Eventually the job was finished and although slightly longer than Lloyds it resembled it in every other way. This was a starting point for me that eventually led to my taking up an apprenticeship and becoming a qualified tradesman. We used to paddle about together in Helliers Creek and Kaipatiki and adopted naval terms for our manoeuvres, such as line ahead and line abreast. We were joined by Ted Hopkins who had an American Indian type canoe built for him by Erol Collins son of another resident who later married Ted's sister and became his brother inlay. So now there were three of us to paddle together. Ted's canoe was much faster than ours and less manoeuvrable than ours making it difficult for us to keep together at times. As time went by more of the local lads acquired canoes so that the fleet grew in numbers. John and David Rainfoot who were the adopted sons of Mr and Mrs Rainford. Roland Mertz son of another well known resident and Keith Robertson who lived in Rosebery Ave were some of the newcomers to the fleet of canoes. One of the popular activities of the group that we named the Mosquito Fleet was known as water fighting. This consisted of coming up along side the other fellow's canoe and trying to fill it with water while he retaliated. As the water at the popular spot was quite shallow at the time there was no danger to participants. Another popular activity was known as landing parties away. This consisted of landing on the paddocks on the Glenfield side of the Kaipatiki creek and charging up the hill holding imaginary guns shouting quick here they come, or clambering up through the bush on the Greenhithe side of Helliers Creek, where once we found an object that looked like one of the bathing tents popular on the beaches of England and Europe. It turned out to be an R.N.Z.A.F. balloon that had broken away from the towing aircraft and landed in the trees. We received a message of thanks for returning it. Lloyd and Ted Hopkins both worked for their fathers on the family farms so on occasions they would get together during the lunch break and do a bit of canoeing on the creek. On one such occasion they were out off Hopkin's Point and Lloyd was paddling along when Ted due to the superior speed of his canoe went racing by shouting Yipee as he went over the top of a wave, due to the fact that it was rather a windy day and there were small waves on Hellyers Creek. This was at its height when Yippee and Ted misjudged and his canoe overturned throwing him into the water. Lloyd brought him ashore hanging to the back of his canoe while the canoe drifted off down Hellyers in the direction of Hobsonville. As luck would have it the canoe got caught up in the mangroves and was able to be retrieved when the tide got further out. 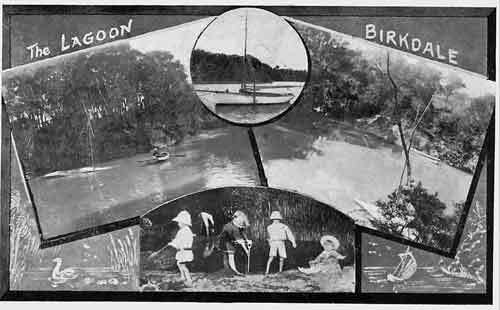 In these days the Lagoon as it was known by the locals, which is located at the Eskdale Rd end of Kaipatiki Creek, was a popular meeting place for children of the district after school and at holidays for swimming and a little diving. This led to the general belief that the lagoon was either very deep or bottomless. Thus one fine afternoon Lloyd and I decided to take a long length of rope and paddle up in our canoes to try and find the depth of the water. We had saved and knotted together numerous pieces of rope hoping it would be long enough to reach bottom. Imagine our shock and surprise when the weight touched bottom at about 1Oft - three Metres. Thus the myth that had existed in the district for so long was exploded. Finally, both Lloyd and I often stood at the corner of Kaihika and Beach Haven Roads some times talking to other youths of the area and the conversation always included the statement that down there is where the bridge is to go one day. To the satisfaction of many locals it seems that this will happen at last. We're paddling along with a smile and a song because we are proud to belong to the M.F. (abbreviation for Mosquito Fleet. ).